Ephemeris for Monday, January 14th. The Sun will rise at 8:17. It’ll be up for 9 hours and 9 minutes, setting at 5:26. The Moon, at first quarter today, will set at 2:04 tomorrow morning. On January 1st, just after midnight eastern time the New Horizons spacecraft made its closest pass of the small Kuiper Belt Object 2014 Mu69, nicknamed Ultima Thule. At just about 10:30 that morning the expected phone home came back over 4 billion miles, and 6 hours travel time from a 15 watt transmitter on the spacecraft. New Horizons was in perfect health an its data recorders were full. It will take 20 months at a thousand bits per second to relay all that information back to Earth. 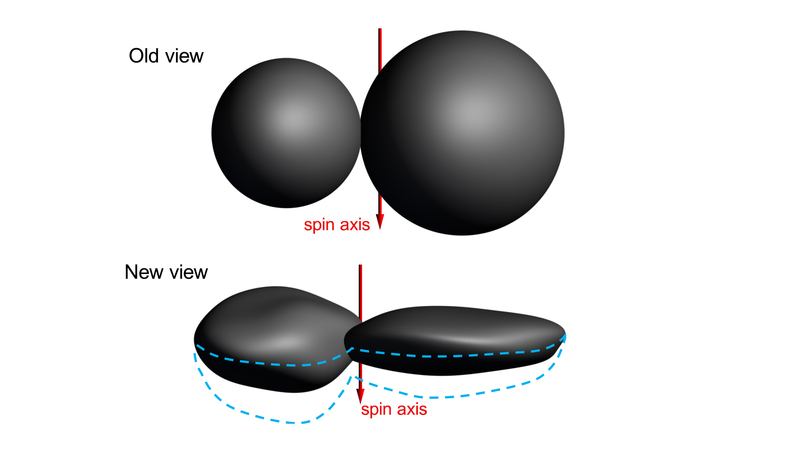 Though we’ll get better pictures to come, Ultima Thule is a contact binary of two nearly spherical bodies that collided very gently. It looks like a snowman of reddish-brown snow. 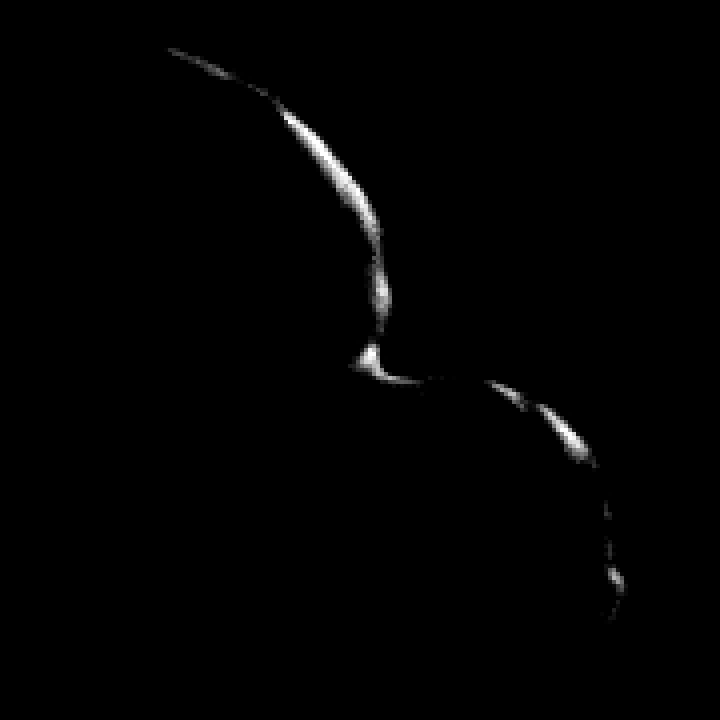 It fits the silhouette made by it passing in front of a star back in 2017. Note from the image: The term “astrometry” (pronounced as-trom-e-try) is the science of measuring the precise positions and motions of celestial bodies. 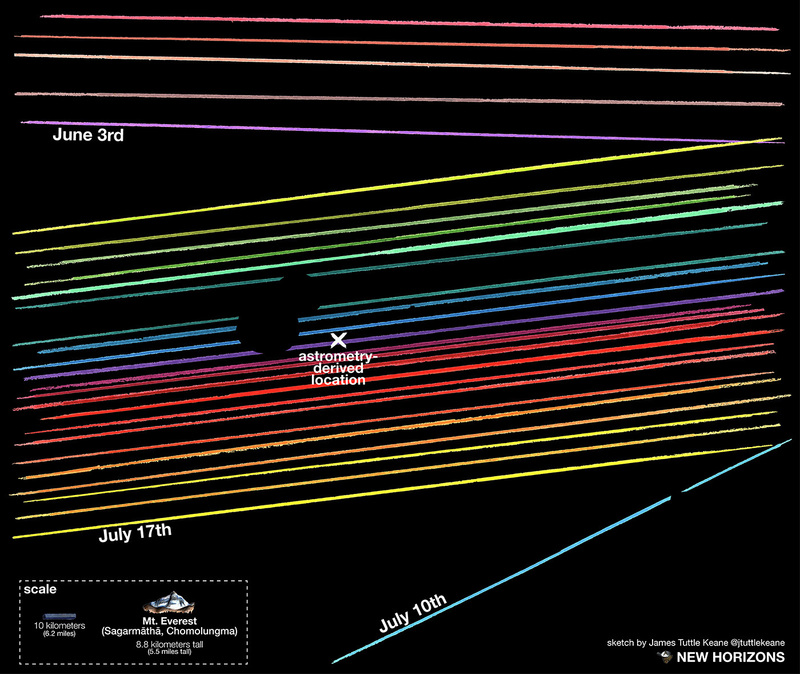 The New Horizons spacecraft went into solar conjunction from January 4th to the 9th. Meaning it was too close to the direction of the Sun to send of receive data due to the Sun’s radio interference. On the night of the 9th I noticed that on the DNS-Now website that the big antenna at Canberra Australia was in contact with it. So more data is flowing down! Ephemeris for Tuesday, January 26th. The Sun will rise at 8:08. It’ll be up for 9 hours and 33 minutes, setting at 5:42. The Moon, 3 days past full, will rise at 8:44 this evening. Last week Dr. Mike Brown and Konstantin Batygin announced that they have good cause to suspect that there is a Neptune sized planet lurking in the outer Kuiper Belt, perhaps 1,000 AU or a 1,000 times the Earth’s distance from the sun. In miles that comes to a possible distance of 100 billion miles from the sun. The evidence is the odd similarity of the orbits of six Kuiper belt objects, including the best known Sedna, whose closest points of their orbits to the Sun, called perihelia are remarkably close together. Planet X is not a name, but a placeholder for something unknown, like X in an equation, which will be replaced by a real designation if found and confirmed. So no, Planet X has not been found, but as Sherlock Holmes would say: the game is afoot. The obit off to the right is the suspected orbit of the unknown body dubbed Planet X or Planet 9. Credit: Mike Brown and Konstantin Batygin. Links to explore this further from reliable sources are: Universe Today, The Planetary Society, and Phil Plait’s Bad Astronomy.